Concepts: Walk the Tokaido route, the coastal road that stretches from Kyoto to Edo. In doing so, you can spend time spending money at the villages, bathing in the hot springs, eating at the taverns and painting the fine landscapes that surround your journey with beauty. Each action earns you points, and the player (of which there are between two to five) to hold the most points by the end of the journey is the winner. Writing: There is almost no storytelling element to this game, although the manual does include a rather lovely segment discussing some of the history of the route. Instead, the best story is that of having the most peaceful holiday trip that you can…. Mechanics: You begin by choosing a character, of which there are loads to choose from, and each has their own respective special abilities. This could be a ronin (who gets a discount on food that he buys), or an artist (who can draw a piece of a painting when he arrives at a tavern), or a priest (who can gets additional points when he donates money at the temples). Once you’ve selected your character, you begin your journey! The game takes place on a route map, with each step on that route being a type of place that your character can visit. Each location works differently – some are simple like the hot springs (draw a card and earn either 2 points if you have a regular bath, or 3 points if your card has a picture of bunch of monkeys invading the hot spring). Some, like the market which allows you to buy souvenirs, are pretty complicated (there are four type of souvenirs that can be bought, and you get a specific amount of points by completing sets of them). Temples allow you to earn points by spending coins at the donation box, and the player who donates the most by the end of the game gets a bunch of extra points. There are also three types of landscape spaces on the board – field, mountain and sea – and if you stop at each space and collect enough cards to complete your landscape painting (3, 4 and 5 respectively), you get points for that too. There are also farms, which you can work at to get some money which you’ll need to indulge during the trip. Lastly, there are encounter spaces, which represent meeting fellow travelers along the road, and the effect of those is random but always beneficial. The first question people ask me about this game is “Okay, let’s begin – who goes first?” The player who is nearest the back of the route is always the one whose turn it is. You can only move forward, and you can move as many spaces as you want. Players move as far along the map as they wish. However, each player can only move into a square that is uninhabited by another player. This means that if another player is in the hot springs, you can’t join them – you’ll need to jog on, lad! 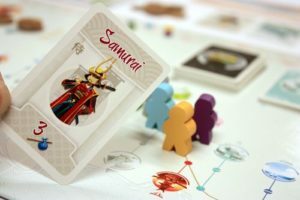 And this is where Tokaido gets really vicious! But more on that later. The final squares on the board are taverns, and they act as checkpoints. When one player gets there, has gets first dibs on which meal he wants to buy. Every player has to stop at these taverns, and the player who arrived at it first can’t leave until everybody else is at that tavern too. Of course, if player four turns up and finds out that player one snarfed all the dough-balls first, then player four has to make do with whatever food is left. If they can afford anything. When all of the players get to the final tavern in Edo, the game ends. Players total up their points, including bonus points for completing achievements like ‘most food from taverns’ and ‘most hot springs splashed about in’, and the winner is crowned. 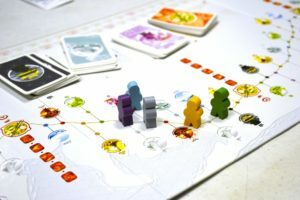 Design: Tokaido is a stylistically beautiful board game. It is crisp, white and minimalist, very much like the artwork of the region that it emulates. It is also very peaceful to play, with some deceptively non-confrontational competitive elements (more on this in a moment). The landscape panoramas illustrated in the cards are especially charming and vividly realized. Throw on some traditional Japanese music in the background and you’re in for an impressively escapist experience. Naturally, this is a game that can be played in a far less backstabby way if that’s your preference, so the above may not suit you or your fellow players. But it’s a great exercise in competitive play without using attack scores and dice-driven combat. Instead, you’re winning by simply having a better holiday – right? Right? 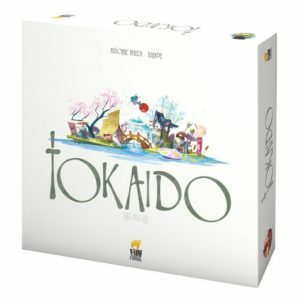 Conclusion: What Tokaido does well is allow the players to have a great experience. That’s the core of the theme, and it’s the core of the gameplay. It keeps each player involved, as you’re always watching what every other opponent is doing and planning your next move in response to it. It’s cut-throat. But it’s also very chill and zen. It has a unique feel to it, and there’s a real novelty to that. While some of the rules can be a little bit fiddly here and there, you never really mind it because this is a lovely and thoroughly charming game that feels like a real joy to play. FINAL THOUGHTS: If you are looking for a game in which you can say “What do you mean that I’ve just sabotaged your holiday? I’m just sitting here in the hot spring with my monkeys!” then this is the game for you.